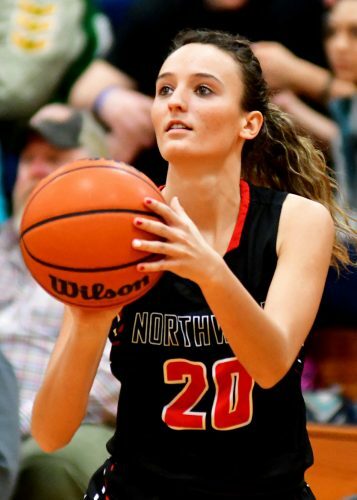 INDIANAPOLIS – Seventy-seven Indiana high school seniors — 39 boys and 37 girls — have been chosen as first-team Academic All-State by the Indiana Basketball Coaches Association. In addition, 203 more boys and 179 more girls were recognized as honorable mention Academic All-State for 2019. Three area basketball players were awarded by the IBCA as Honorable Mention Academic All-State in Warsaw’s Maddie Ryman, Wawasee’s Bennett Hoffert and NorthWood’s Mackenzie Bergman. The IBCA Academic All-State teams are voted on based on academic performance in the classroom as well as the basketball performance on the court. Basketball seniors must meet criteria that include a 3.5 GPA or higher on a 4.0 scale, a class rank in the upper 25 percent of one’s class, an SAT score of 1,100 or an ACT score of 24. The IBCA has selected an Academic All-State team for boys since 1973 and girls were included starting in 1980. IBCA Academic All-State honorees for boys basketball from the area include Noah Applegate of Penn, Cole Filson of Plymouth, Elijah Hales of Westview and Ridley Zolman of Central Noble. IBCA Academic All-State honorees for girls basketball from the area include Bethany Haden of John Glenn and Meleah Leatherman. IBCA Honorable Mention Academic All-State honorees for boys basketball include Konrad Borgmann, Bryaden Casper, Kamdyn Lester and Logan Parrett of Manchester, Austin Brandt, Sam Griffeth and Wilson Smith of Winamac, Evan Dreibelbeis and Gabe Weiss of John Glenn, Joseph Good and Porter Revoir of Goshen, Evan Manges and Justin Zumbrun of Bremen, Joshua Adejokun of Peru, Michael Bender of East Noble, Jacob Brose of Central Noble, Cameron Scott of Columbia City, Drew Seegert of Northridge, Luke Shoemaker of Concord, Hank Smith of Elkhart Memorial, Logan VanderVelden of Wabash and Dennis Wingard of Westview. IBCA Honorable Mention Academic All-State honorees for girls basketball include Ashley Beckler, Meghan Bontrager, Jenna Bradberry and Lauren King of Northridge, Hannah Bobo, Makenzie Kilmer and Jayda Smith of Penn, Megan Godfrey and Tori Miller of West Noble, Grace Cotter of Columbia City, Maggie Gallagher of Goshen, Anya Kauffman of Bethany Christian, Cece Robinson of Plymouth, Kaelyn Shively of Bremen, Tori Skaggs of Elkhart Christian and Kiley Stone of Wabash.